The Utah State Fair, like most other state fairs (I assume) has the livestock competition. Cattle, sheep, swine, rabbits, goats, and other animals are put on display so spectators can admire their size and appearance. After a period of a few days, new animals are brought in for the same purpose. Eventually winners are chosen and ribbons are awarded to those who have the most impressive "performance." So it is with a singles ward. Hundreds of young people flood the chapel, each claiming their desire to be spiritually lifted, yet other motives are afoot. The first few minutes of sacrament meeting and Sunday School are spent scanning the room for the fresh "livestock." Men and women alike are drawn to church each Sunday with the hope that they'll find their blue-ribbon partner. There's no secret - single's wards perpetuate an atmosphere of competition. Your best friends are your toughest opponents. The elephant (or in this case, the large pig) in the room is MARRIAGE. Jokes are made in every talk, lesson, and testimony, and although we all laugh, it's everyone's worry. A ward full of singles, you would think, should be a petri dish of love. Marriages should happen so much more frequently than they do. It so often seems that we enjoy walking between the pig pens trying to decide which one we like best. We're afraid to give away our blue ribbon, because we only have one. 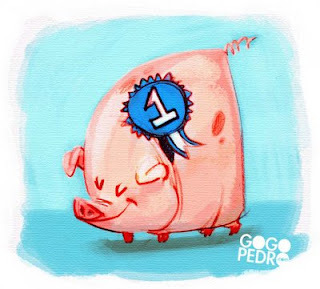 We're all awaiting the day that we finally award the ribbon and take home our prize pig. Until then, we're confined to walk the stinky pens of dating looking for our favorite pig*. *The word "pig" in no way represents the way I feel about women. It is simply congruent with my analogy. No ill feelings intended.